During January 2014, Amsterdam Quarterly writers read their work in three different venues. On 10 January, publisher/editor Bryan Monte and writers Nonnie Augustine (AQ9) and Sara Shea (AQ9) read at the Open Mike of the Blue Flower Arts Winter Writers’ Conference at the Atlantic Center for the Arts in New Smyrna Beach, Florida. On 13 January, writer Joan Z. 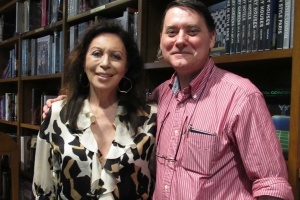 Shore (AQ2 & 4-6) read passages from her novel, Red Burgundy, for a French-themed evening with Bryan Monte at Books & Books in Coral Gables, Florida for a small, but enthusiastic audience. Four yearbooks were signed that evening. On 15 January Amsterdam Quarterly’s West Coast reading took place as part of the Smack-Dab series at the Magnet in San Francisco’s Castro District. Writers who read included (in alphabetical order) Don Brennan (AQ8), Adam Cornford (AQ5 & 9), Marvin Hiemstra (AQ5 & 8-9), Tobey Kaplan (AQ8 & 9), Bryan Monte, Edward Mycue (AQ1, 4, 6-7), and Andrea Rubin (AQ4, 10-11). There was also a photographic slide presentation by Rink (AQ2 & 8). Sixteen yearbooks were signed that evening and the reading was covered in the 23 January issue of Bay Times. 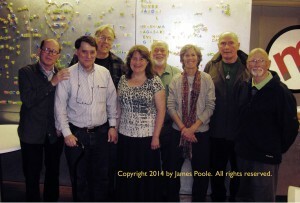 Readers below from l. to r. are Rink, Bryan Monte, Adam Cornford, Andrea Rubin, Ed Mycue, Tobey Kaplan, Marvin Hiemstra and Don Brennan. Photo copyright 2014 by James Poole. All rights reserved.